Garde manger (IPA: [gaʀd mã.ʒe]), meaning “keeper of the food” or pantry supervisor, refers to the task of preparing and presenting cold foods. These typically include such food items as salads, hors d’œuvres, cold soups, aspics, and charcuterie. Larger restaurants and hotels may have the need for the garde manger to perform additional duties, such as creating decorative elements of buffet presentation like table arrangements and edible centerpieces made from materials such as ice, cheese, butter, salt dough or tallow. In most modern kitchens however, the garde manger is synonymous with pantry chef, having duties focusing on salads, soups, cold food items, and dessert platings. It is usually the entry level line cook position within a restaurant. Well, the semester’s almost over and while I feel like I know some of the principles of garde manger, I certainly don’t feel like I’ve got a handle on the whole thing. Chef Ray should teach Advanced Garde Manger. 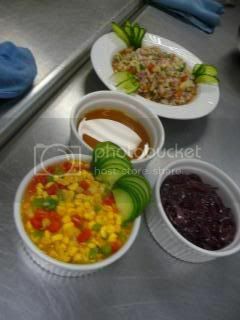 (Hint, hint, ARC) We made sauces, sausages, salads, sandwiches……….and terrines. A terrine is a glazed earthenware (terracotta, French terre cuite) cooking dish with vertical sides and a tightly fitting lid, generally oblong or oval. Modern versions are also made of enameled cast-iron. 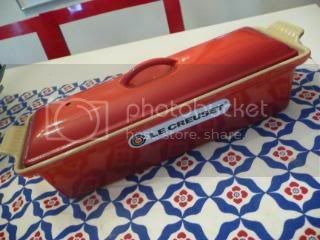 This red Le Creuset terrine I got for my 40th birthday from my dad and was one of my favorite birthday gifts…ever. Although I haven’t even used it yet. 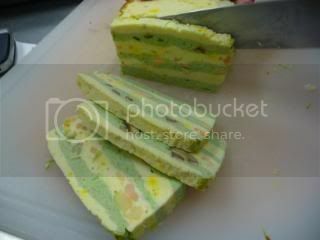 But really, I just learned how to make a proper terrine right before my surgery so I do have the gimp excuse. Sorry dad. By extension, the term also refers to food prepared and served in a terrine, mainly game and venison, brawn (head cheese) and pâtés. 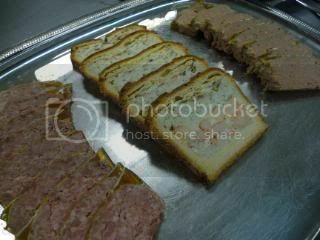 If it has been pressed and chilled, then turned out for serving in slices, a terrine becomes a pâté, which Julia Child called “a luxurious cold meatloaf”. 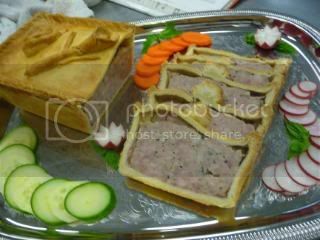 All four tables in our class made different terrines and pate preparations. I stupidly forgot my camera one night, so you are missing out on the photos of foie gras en brioche. I can tell you it was damn delicious. 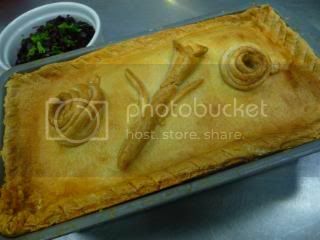 The terrine my table made was rabbit with green peppercorns en croute. I got to liberate the rabbit meat from it’s carcass. Did you know that skinned rabbits look a lot like cats? But bigger hind legs. Anyway, it was mixed with pork meat, fatback and the rabbit’s liver. You have to get all the meat ice-cold at this point then you can grind it. After the meat is ground, it’s mixed with seasoning–salt, pepper, pate spice–and it’s garnishes–green peppercorns and tiny cubes of ham–and put into the terrine and cooked in the oven in water bath. 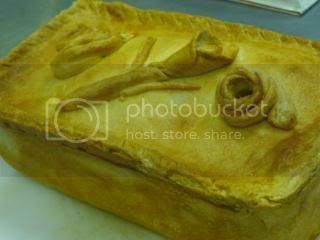 When cooled, the meat is removed and wrapped in dough. 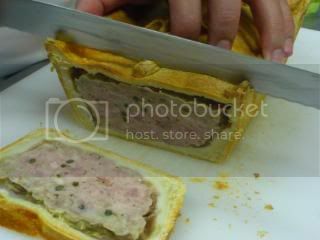 You have to make blow holes in the top for steam to escape and also as a spot to pour in aspic later. We decorated ours with dough roses. 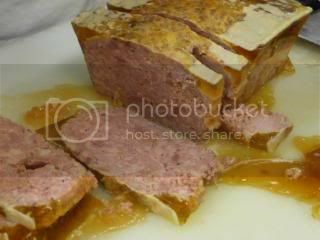 So when the dough-wrapped terrine cool, you pour aspic—carefully!—through the blow holes to seal up any little holes in the meat and between the meat and dough. Then it goes back in the fridge to set. At this point, we made sauces to go with our terrines. I had my cast on by this point, so I volunteered to make the mustard since it was mostly a one-handed item. It was really delicious and I encourage everyone to make it. Combine all ingredients. Let stand for one hour. Cook over a double boiler until thick and smooth. Now it was time for slicing and eating! As you can see, it was a lot of work for a small return. But it was decadant and delicious and definately worth it. Impress your pals with an old-school French terrine at your next dinner party!